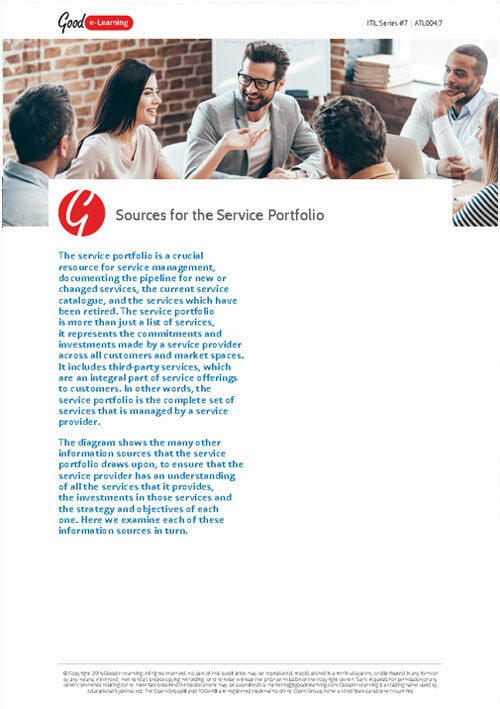 The service portfolio is a crucial resource for service management, documenting the pipeline for new or changed services, the current service catalogue, and the services which have been retired. The service portfolio is more than just a list of services, it represents the commitments and investments made by a service provider across all customers and market spaces. It includes third-party services, which are an integral part of service offerings to customers. In other words, the service portfolio is the complete set of services that is managed by a service provider. In this ITIL article we provide a diagram that shows the many other information sources that the service portfolio draws upon, to ensure that the service provider has an understanding of all the services that it provides, the investments in those services and the strategy and objectives of each one. Here we examine each of these information sources in turn. Used as part of the problem management process, this can assist in identifying where the emphasis of root-cause analysis should be focused. Download this free ITIL learning resource and you’ll also get instant access to over 535+ business & IT learning resources!